This plugin provides a bar view(icon, name, timer) or slider view(all effects on one bar) of buffs, debuffs, and pot cooldowns you have on your character. It also includes a dynamic quickslot bar that will popup when curable debuffs or low morale/power conditions exist on you character to enable you to quickly clear the effect. Click here to see a video showing the plugin in action. Unzip the PengorosPlugins folder to your Documents/The Lord of the Rings Online/Plugins folder. The zip file is also compatible with Bredic's LotRO Mod Manager, simply drag the zip file onto the manager window and activate it. 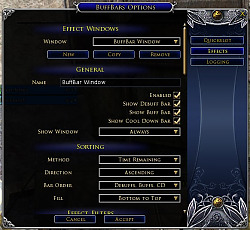 Effect windows contain one or more sections of bars, buffs, debuffs, and cooldowns. A bar consists of an icon, name, timer, and a bar graph indicating the remaining time. Optionally disable a window instead of deleting it. Effect sliders contain all the buffs and debuffs in one bar. It accomplishes this by compressing larger time values into a smaller area so that you see the items that are most relevant. What this means is that as effects get closer to 0 they will move more quickly across the bar. The quickslot bar is a dynamic bar that will show pots or skills when you character has certain conditions like low morale/power or curable debuffs. The conditions which show quickslots are driven by triggers. A trigger allows you to set specific conditions like only things with 'wound' in the name or show this quickslot when I don't have a motivated buff. The triggers are very flexible. Triggers are customizable and include options like effect name, effect category, curable, is the effect present or not present. Optionally disable a bar instead of deleting it. The plugin now supports showing timers for mob debuffs and crowd control. There are triggers that you can add specifically for this. In order for it to work you must be running the Combat Analysis plugin which feeds BuffBars the required info in order to display them. It can be found here. Only load the plugin when the UI is locked and not hidden. The current lua api doesn't have support for querying the current state. Pot cooldowns are tracked base on quantities due to lack of api support. This means it is possible to fake out the system by decreasing a pot stack size by 1. In event this happens simply right click the cooldown bar to reset it. The Turbine event system sometimes calls the effect removed event early. This results in what appears to be the effect being removed prematurely. It is most evident on the effect slider when the effect doesn't slide all the way to 0. 2.0.2 - (4/2/2012) A fix for the problems encountered with black/white lists and matching text with special characters. 2.0.3 - (4/3/2012) Fixed the problem with trigger windows not opening and CA effect icons. Added support for choosing the locale and updated the German translation. 2.0.4 - (6/15/2012) Fixed a couple bugs relating to settings. The settings will now reset themselves if they are corrupted. 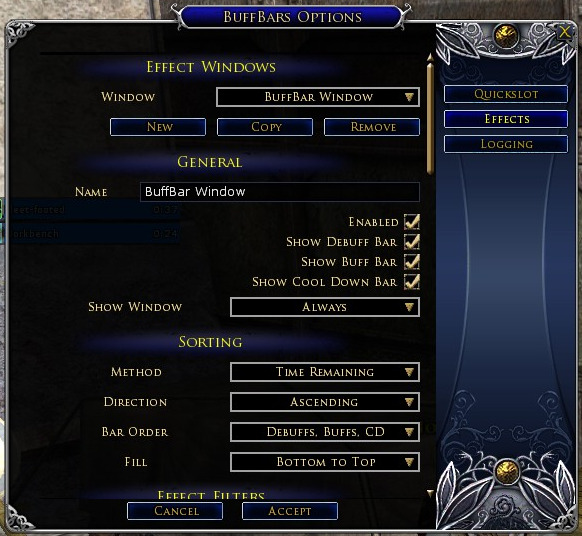 2.1.0 - (12/8/2012) Added support for storing quickslots/windows/sliders on an account level or character level. 2.1.1 - (11/4/2013) Fixed a bug where settings were tied to the client language. Added a festival item category. I'd like to give a special thanks to Vevenalia for translating the plugin into french and helping me debug some of the weird translation issues. Also many thanks to Taralas and Farothhen for the german translation. Last edited by Dolby : 09-09-2010 at 03:48 PM. the utility file is a bunch of symbols....do i cut and paste that or what? does it go into its own folder where the plugin folder goes? While this is much better than vanilla and will help significantly with my warden, I guess I misunderstood the capability when thinking of my LM and Cap. I was under the impression that CD would include CD's of spells I cast on others (like Blinding Flash, pet buffs, Cap buffs on other people, etc). However, looks like I can only show effects on me. Any possibility of this being an additional feature? (I understand that the limitation is likely the availability of the data thus it likely can't work). Also is it possible to make a smaller view that goes sideways, like an icon on top, with the timer underneath and just be say 40 px wide with new icons appearing to the right instead of top/bottom? I downloaded the file and have it inside of my plugins folder, but it will not show up in game for some reason. I have the orender buff bar already on my system could that be causing a problem? Yes delete the OrendarPlugins folder. I renamed the plugin to match my forum name so that people wouldn't be confused. The buffs/debuffs of fellow/raid/targets are not available to us yet via the api. Once they are available you will be able to create effect windows to monitor those as well. I can look at making a horizontal version. Vertical text isn't possible so there are a few caveats to it. I deleted the Orendar one and the system will not recognize that I have the pengoras one at all. It doesn't show up in my plugins list in game or my shadymanager. Did you happen to load the plugin when you had your UI unlocked? Do you have a PengorosPlugins folder in your My Docs/The Lord of the Rings Online folder? And what files are inside that? Nope, I loaded the plugin when my UI was locked. Also, I get the same error on the quickslots bar. Last edited by Stormsworn : 09-09-2010 at 11:46 AM. If you add that check for nil the error will go away. In theory you shouldn't be able to get into a state where you have a nil dragBar as I create the dragBar when you unlock the UI and destroy it when you lock it. I'm still investigating how you did that exactly. Also are you using the latest DragBar class? Last edited by Pengoros : 09-09-2010 at 11:59 AM. On the next build can you add the ability to ignore CD's in the same manner as Buffs/Debuffs? I'd like to have a bar that shows only the Morale Potion CD, and/or a bar that shows only the Power Potion CD, etc.